A recipe born from a glut of broccoli! Cook your pasta according to the packet instructions. Meanwhile place a large frying pan over medium heat and add the olive oil, butter, salami and shallot and sauté until the shallot softens. Add the garlic greens, anchovies and chopped broccoli and cook stirring for 4 – 5 minutes. Add the verjuice and cook for a further 2 minutes. Drain the pasta and add to the broccoli mixture together with the parsley and toss through. Season with salt and pepper and divide between four serving plates. 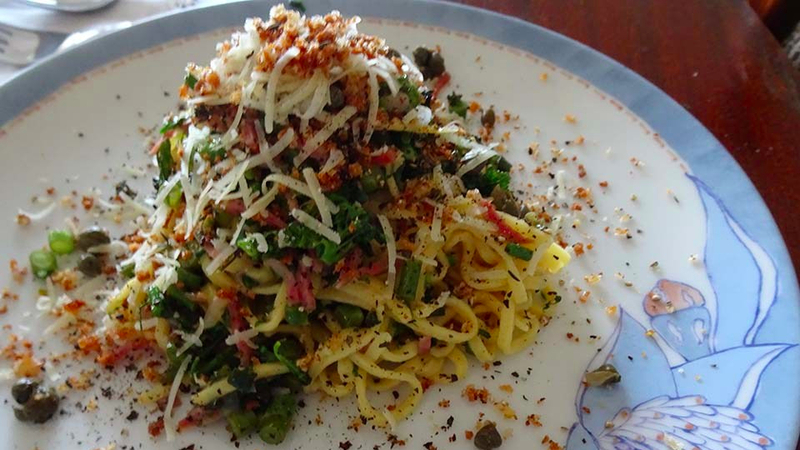 Sprinkle with parmesan and top with the crunchy garlic breadcrumbs, and finally scatter over the capers. Preheat the oven to 200˚ C / 400˚F (fan). Combine the thyme leaves, breadcrumbs and crushed garlic together. Chop the purple sprouting broccoli into small pieces of approx 1 – 1.5 cm (1/2 inch) for the florets and 1/2 cm (1/4 inch) for the stem. You will need 2 cups altogether. Place a dish with a little extra grated parmesan and another with any left over crumbs on the table for people to help themselves. If you do not have Purple Sprouting Broccoli, you could use or broccolini.